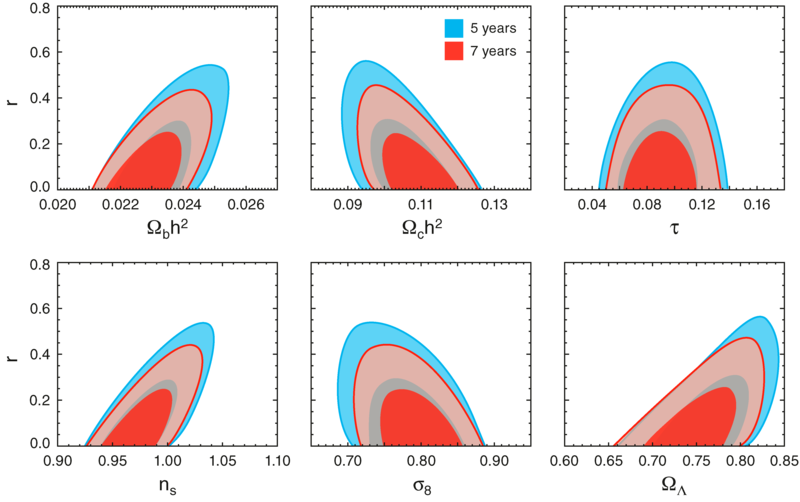 WMAP Seven-year Paper Figures, D. Larson, et al. The 7-year temperature (TT) power spectrum from WMAP. 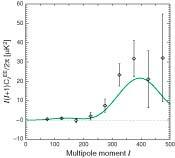 The third acoustic peak and the onset of the Silk damping tail are now well measured by WMAP. The curve is the ΛCDM model best fit to the 7-year WMAP data: Ωbh2= 0.02270, Ωch2= 0.1107, ΩΛ= 0.738, τ= 0.086, ns= 0.969, Δ2R= 2.38 × 10-9, and ASZ= 0.52. 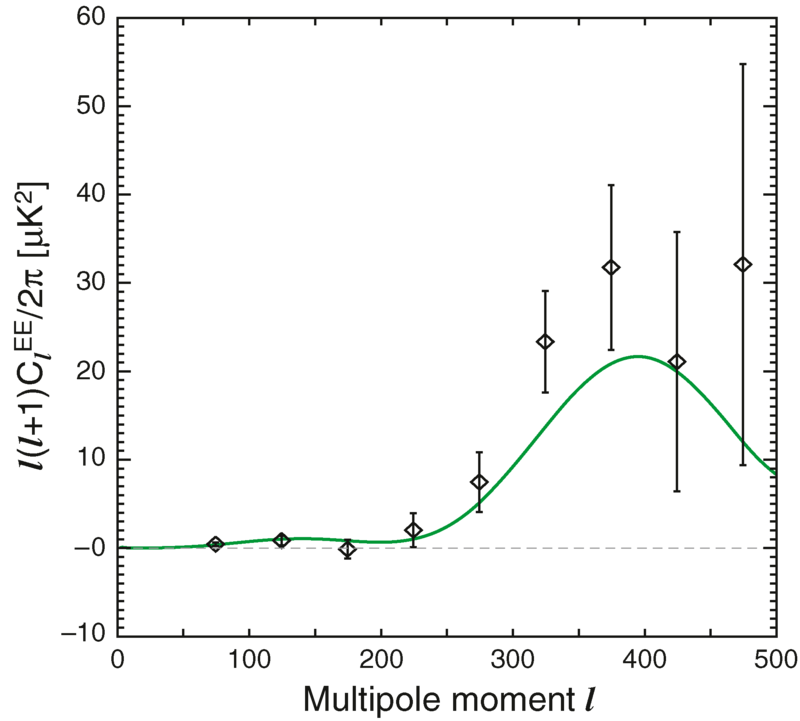 The plotted errors include instrument noise, but not the small, correlated contribution due to beam and point source subtraction uncertainty. The gray band represents cosmic variance. A complete error treatment is incorporated in the WMAP likelihood code. The points are binned in progressively larger multipole bins with increasing l; the bin ranges are included in the 7-year data release. 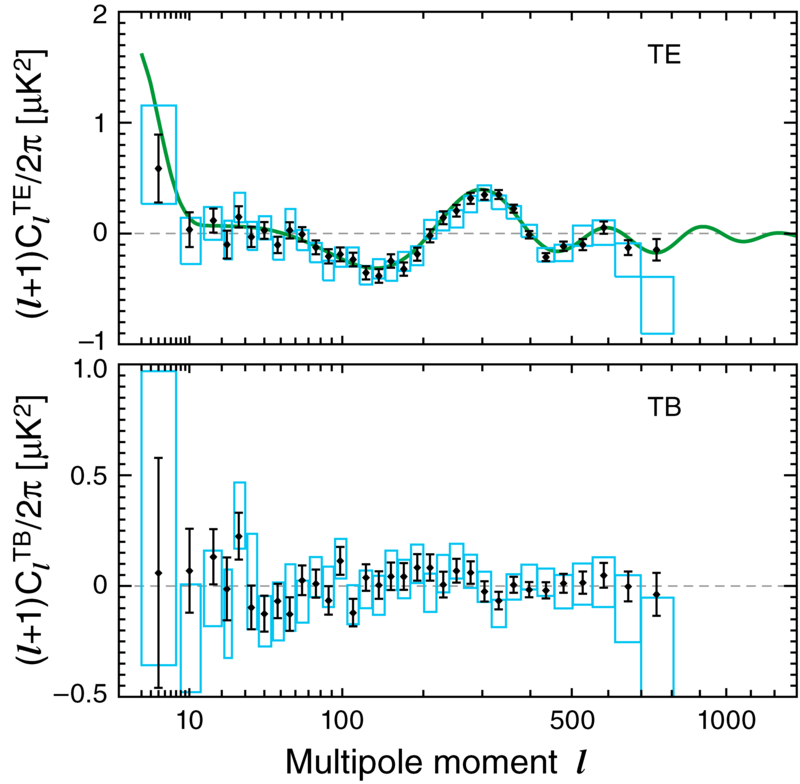 The high-l TT spectrum measured by WMAP, showing the improvement with 7 years of data. The points with errors use the full data set while the boxes show the 5-year results with the same binning. The TT measurement is improved by >30% in the vicinity of the third acoustic peak (at l ≈ 800), while the 2 bins from l = 1000–1200 are new with the 7-year data analysis. The 7-year temperature-polarization (TE) cross-power spectrum measured by WMAP. The second trough (TE<0) in the spectrum in the vicinity of l = 450 is now clearly detected. The green curve is the ΛCDM model best fit to the 7-year WMAP data, as in Figure 1. The plotted errors depict the diagonal elements of the covariance matrix and include both cosmic variance and instrument noise. A complete error treatment is incorporated in the WMAP likelihood code. Note that the plotted spectrum is (l + 1)ClTE /(2π), and not l(l + 1)ClTE /(2π). 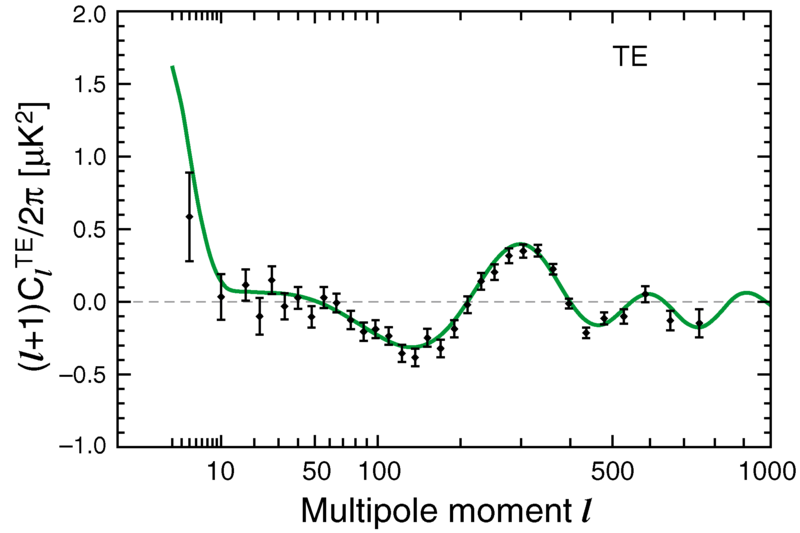 The TE and TB high-l spectra measured by WMAP, showing the improvement with 7 years of data. The points with errors use the full data set while the boxes show the 5-year results with the same binning. The spectra are greatly improved by the addition of W-band data. The non-detection of TB signal is expected; it provides a good check of systematic errors and foreground residuals, and can be also used to set limits on polarization rotation due to parity-violating effects (§2.4 and Komatsu et al. (2010)). 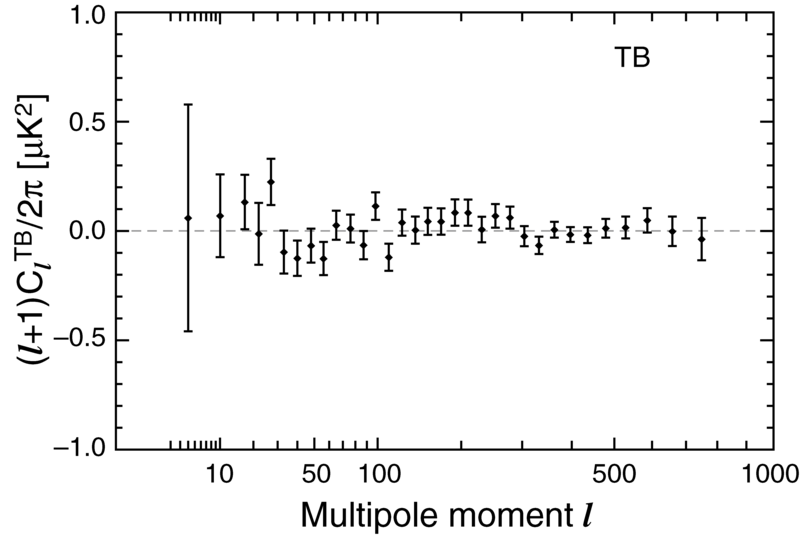 The 7-year temperature-polarization (TB) cross-power spectrum measured by WMAP. This spectrum is predicted to be zero in the basic ΛCDM model and the measured spectrum is consistent with zero. TB provides a useful null test for systematic errors and foreground residuals. Komatsu et al. 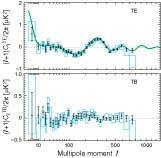 (2010) use the TB and TE spectra to place an upper limit on polarization rotation due to parity-violating effects. The TB Χ2 for the null hypothesis (TB=0) is 851 for 777 degrees of freedom. The probability to exceed that amount is 3.2%, which is slightly low, but not unreasonably. Note that the plotted spectrum is (l + 1)ClTB /(2π), and not l(l + 1)ClTB /(2π). Conditional likelihoods of l(l + 1)ClEE /(2π) for l = 2–7, computed with the WMAP likelihood code. 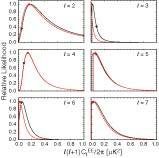 The Ka, Q, and V bands contribute to the low-l polarized pixel likelihood. In each panel, the black curve is the conditional likelihood for a given multipole when all other multipoles are held fixed at the value of the best-fit ΛCDM model (indicated by the black diamonds). 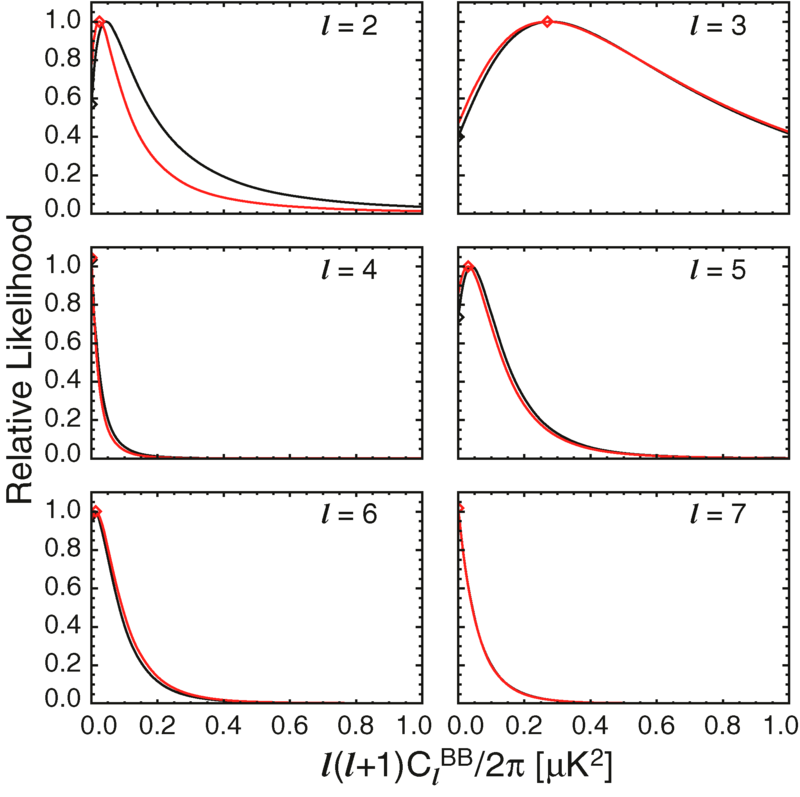 The red curve in each panel is the conditional likelihood when all other multipoles are held fixed at the maximum likelihood value of the spectrum, indicated by the red diamonds. The maximum likelihood spectra were determined by a numerical maximization of the WMAP likelihood code, for l = 2–10, for TT, TE, EE, and BB. Points with l > 10 were fixed at the best-fit ΛCDM value. The relative Χ2 for a single bin of l(l + 1)ClEE /(2π) from l = 2–7, conditioned on the best-fit ΛCDM spectrum. For simplicity, we set ClTE = 0 for l = 2–7 for this evaluation, so that the constraint ClTE ≤ √ClTT ClEE will always be satisfied. The vertical red lines indicate where ΔΧ2 = 1, 4, 9, and 16, corre- sponding to 1, 2, 3, and 4 σ confidence limits on EE. The EE=0 point in this bin has ΔΧ2 = 26.5; additionally, setting TE=0 in the 2–7 bin raises Χ2 by 3.5 relative to the best-fit ΛCDM TE spectrum. 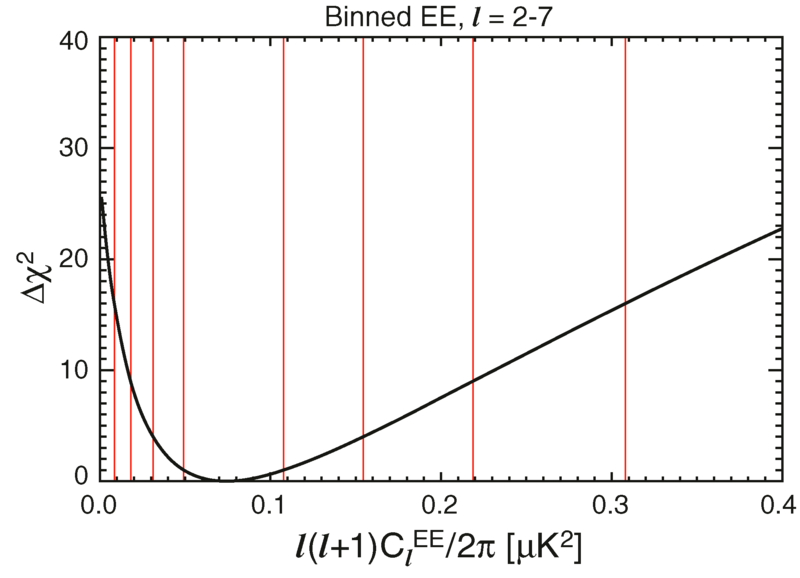 Thus the full change in Χ2 between the best-fit model and the EE=TE=0 model is 30, corresponding to a 5.5σ detection of EE power in this bin, with l(l + 1)ClEE /(2π) = 0.074+0.034-0.025 µK2 (68% CL). Conditional likelihoods of l(l + 1)ClBB /(2π) for l = 2–7, computed with the WMAP likelihood code. 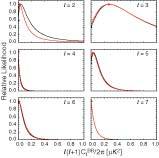 The Ka, Q, and V bands contribute to the low-l polarized pixel likelihood. 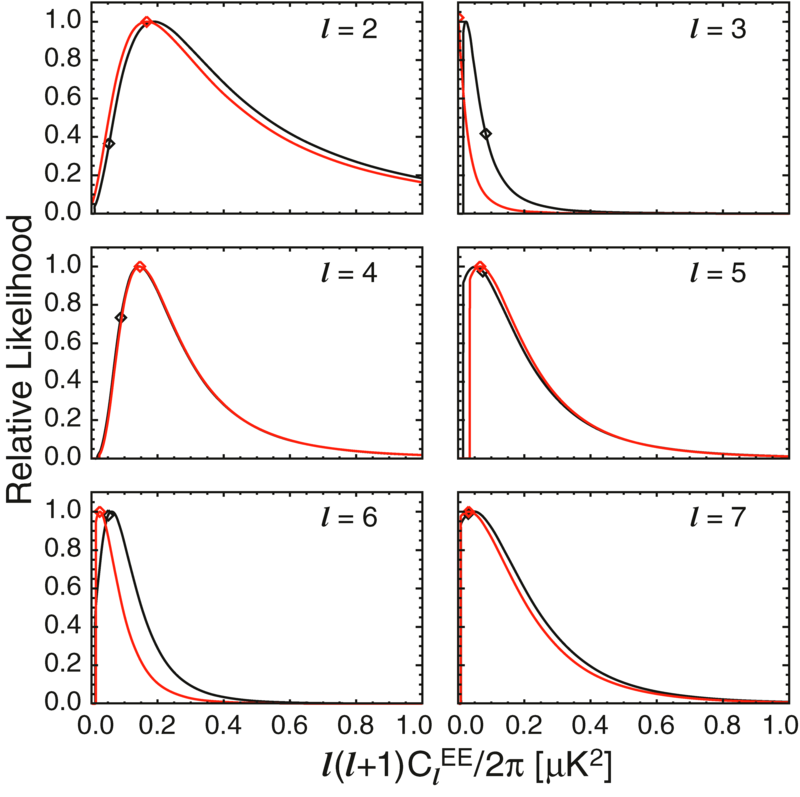 In each panel, the black curve is the conditional likelihood for a given multipole when all other multipoles are held fixed at the value of the best-fit ΛCDM model (effectively zero, except for gravitational lensing) as indicated by the black diamonds. The red curve in each panel is the conditional likelihood when all other multipoles are held fixed at the maximum likelihood value of the spectrum, indicated by the red diamonds. The maximum likelihood spectrum was determined as stated in the caption to Figure 6. The relative Χ2 for a single bin of l(l+1)ClBB /(2π) from l = 2-7, conditioned on the best-fit ΛCDM spectrum. 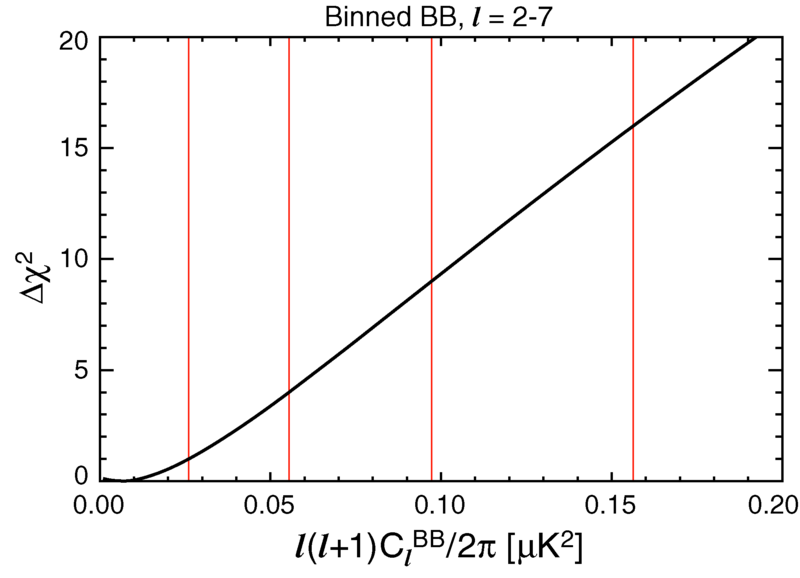 The vertical red lines indicate where ΔΧ2 = 1, 4, 9, and 16, corresponding to 1, 2, 3, and 4 σ confidence limits on BB. We find an upper limit of l(l + 1)ClBB /(2π) < 0.055 µK2 (95% CL). WMAP detects the high-l EE power spectrum. The green curve is the best-fit ΛCDM model power spectrum, and the data are a combination of Q-, V-, and W-band data. 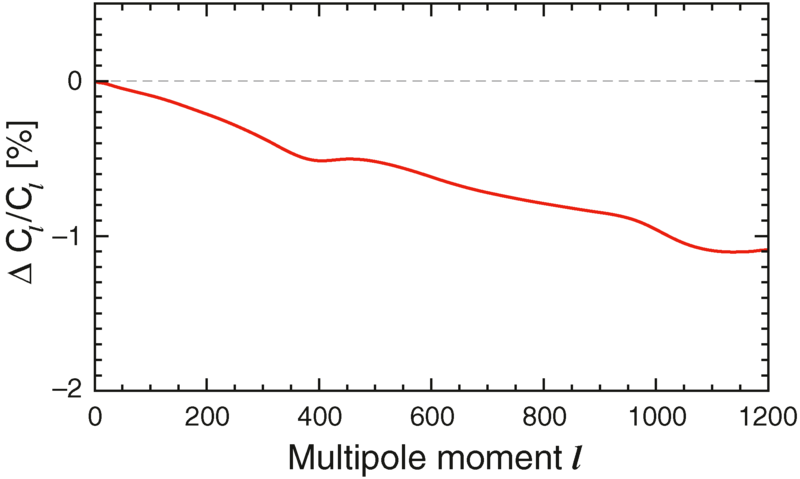 In the multipole range 24 ≤ l ≤ 800, the detection is above 8σ. 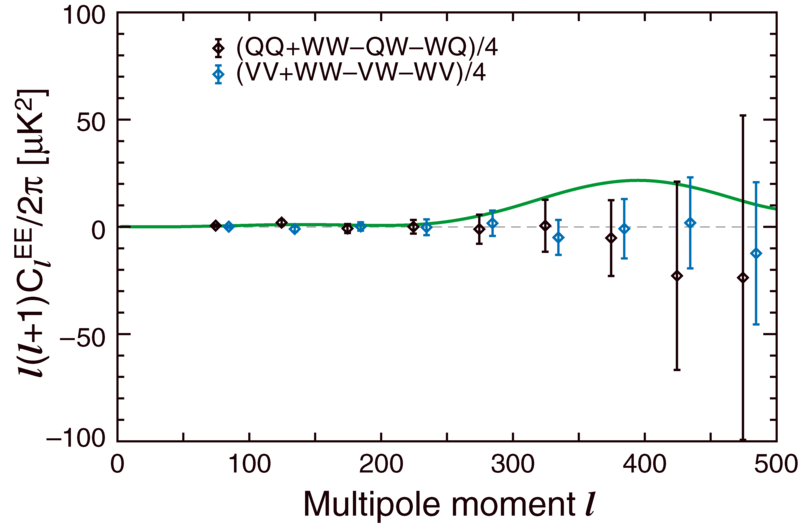 Q − Wand V − Wband difference spectra for EE are consistent with zero, as expected. The green line is the ΛCDM EE spectrum, which should not match this data, but is plotted to illustrate the size of the null-test error bars, compared to the detected signal. The red line in this figure represents the percentage change in the ClTTspectrum, due to the change in RECFAST from version 1.4.2 to version 1.5, including additional physics of the hydrogen atom. 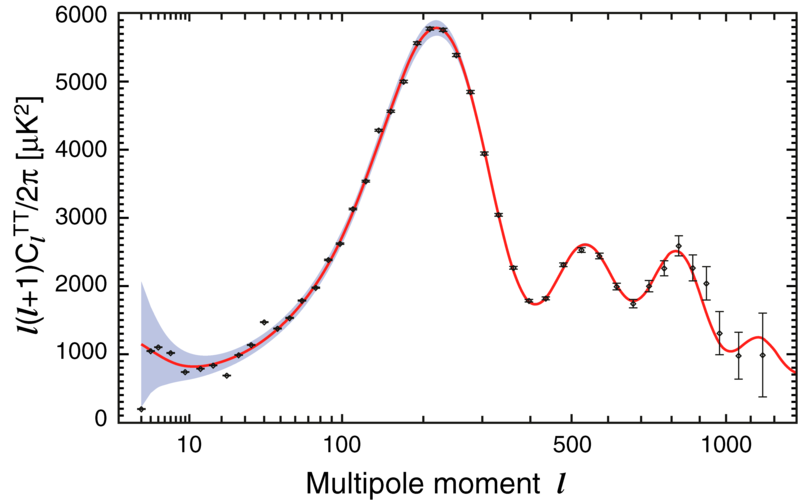 Gravitational wave constraints from the 7-year WMAP data, expressed in terms of the tensor-to-scalar ratio, r. The red contours show the 68% and 95% confidence regions for r compared to each of the ΛCDM parameters using the 7-year data. The blue contours are the corresponding 5-year results. 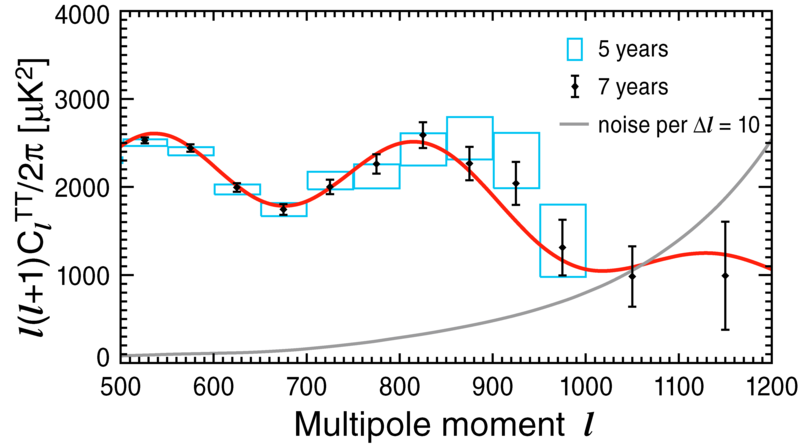 We do not detect gravitational waves with the new data; when we marginalize over the 6 ΛCDM parameters the 7-year limit is r < 0.36 (95% CL), compared to the 5-year limit of r < 0.43 (95% CL). Tighter limits apply when WMAP data are combined with H0 and BAO constraints (Komatsu et al. 2010). The range of non-flat models consistent with the WMAP 7-year data. 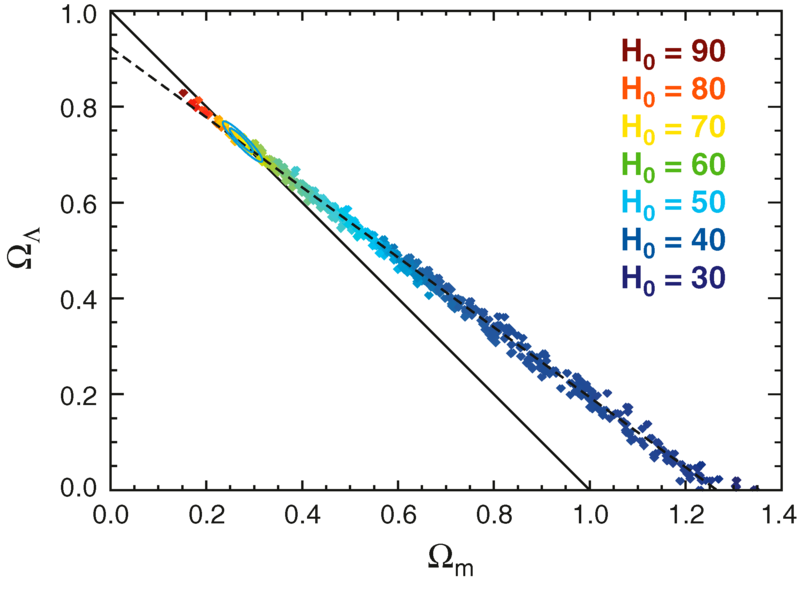 The plotted points are drawn from the Markov chain (ΛCDM, with curvature, fit to WMAP data only); the color of each point indicates the Hubble constant for that element in the chain, as indicated in the legend. Due to the geometric degeneracy, CMB data alone do not strongly constrain closed models with ΩΛ+Ωm > 1, provided a low Hubble constant is tolerated, see Table 6. The dashed line parameterizes the geometric degeneracy in the 7-year data: Ωk= -0.2654 + 0.3697ΩΛ. When WMAP data are combined with H0 and BAO data, the result strongly favors a flat universe: 0.99 < Ωtot < 1.01 (95% CL) (Komatsu et al. 2010). The joints constraints, shown as 68% and 95% blue contours, provide compelling support for basic ΛCDM.